Farnam Street's raison d'etre and it's content (which exalts virtuous goals like: promoting mental stimulation and beneficial thought processes, to name a few) has resonated with me. I'm sure it will with you too. Today I wrote a few notes regarding the profile on Simon Kuznets, who won the Sveriges Riksbank Prize in Economic Sciences in Memory of Alfred Nobel in 1971 - but I've yet to synthethise my thoughts regarding Kuznets' win and flesh out a proper profile. As I predicted, and as I originally intended - with this Nobel Prize in Economics Profile Series, I've gotten more than what I bargained for. In looking to understand more about what lies behind past and present economic theory, and how the different prizes represent (pardon the redundant use of terms to denote points in time) the past, present and future in mainstream and heterodox economics, I've found out about different Economists, Intellectuals, Politicians, Revolutionaries and all around influential people through the tangential topics that are related to the different schools of economic thought that have shaped the history of economic thought. 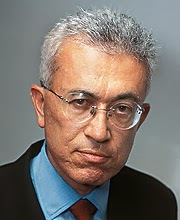 One of the people I read about today that falls neatly into one of the aforementioned categories is Roberto Mangabeira Unger, a professor at Harvard Law School and a Brazilian politician, who knows the topics I've only begun to learn about inside-out. As an aside and complement to this series, I will make sure to mention these people, to effectively archive their significance as part of the whole that makes up the social science and politics-led world we all live in today. An interesting video in which Roberto Mangabeira speaks of what could be. 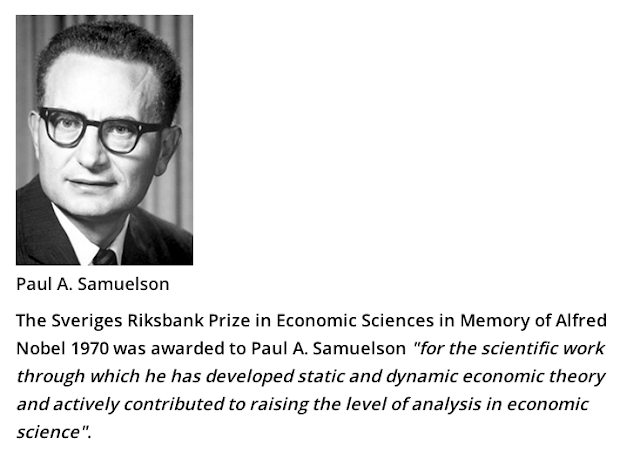 Samuelson's work was so multi-faceted that even the reason for having given him the prize is general ("...actively contributed to raising the level of analysis in economic science."). 1) He was the first American to win the Nobel Prize in Economics - paving the way for many fellow citizens to come. 2) As a mathematical economist, his contributions to economic analysis and its sophistication were pervasive and permanent - bringing in an era of applied economics, where economic theory was complemented and either validated or updated through rigorous examination. Revealed preference: a concept first introduced by Samuelson. After having checked out the nobelprize.org website, and read a little more about Samuelson, I realized how important it was to understand the whole picture before jumping to conclusions about the why and how regarding his prize. I took a look at his lecture and banquet speech - in order to get the full picture behind his nobel prize win. Having remembered my previous post, I quickly looked up the 1969 winners to take a quick peek at both Frisch's and Tinbergen's lectures as well. I was taken aback at their collective genius - not surprisingly, they all summarized their academic findings, the theory behind their reasoning, and the different applications of their methods, models and economic concepts in an all-encompassing way...subtly and very casually explaining their body of work and what led up to it. All these lectures are equally stupendous and very revealing, concerning the men that gave them and the greatness behind them. 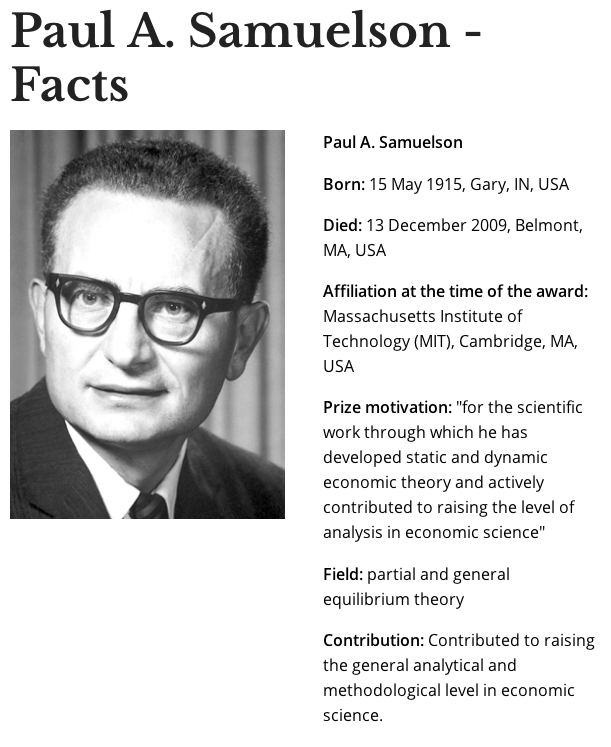 Paul Samuelson's lecture starts by mentioning how Economics is more than an Academic afterthought - that its relevance in his lifetime was stronger than ever, and that its practical application (e.g. as "managerial economics") is a reality today, more so than ever before. Note that "today" then was 1970. A tangent I will look to take soon is to delve deeper into the different economic concepts that can be linked to business, management, finance and other economic fields and subfields which have practical applications for those of us that look to go beyond the academic. 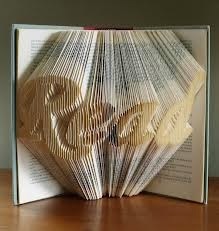 I will leave that for a future post. "A good explanation is a simple one that is easy to remember and one which fits a great variety of the observable facts." "The scientist who formulates laws of observed empirical phenomena is essentially an economist or economizer." In other words, the observational empirical-led and data-driven analytical approach can lead to thorough economic analysis. An Economist, in essence, to Samuelson was a Maximizer - a person or entity that made the most of what he was able to given the resources available to him. Anyone can attest to the fact that these 5 points can certainly apply to what leads to success in realms outside of Economics. Learning to properly observe and analyze, as Samuelson certainly did, can only help.